More land has been confiscated by Arakan state authorities for recently resettled Rakhine villagers in southern Maungdaw, according to a Rohingya farmer who spoke to Kaladanpress on condition of anonymity. Much of the Rohingya populations in Arakan state have been restricted to their villages since the sectarian violence broke out in June. They can’t work; therefore they have no means to feed their families. Some are getting limited support from aid groups in the southern areas of the state. But in the north, where many Muslims are on the verge of starvation, there are no relief groups helping them. Groups like Nasaka (Burma’s border guard force) are making their lives even harder by making arbitrary arrests to extort money, and there has even been allegations of summary executions by the notorious border force. As Myanmar enjoys the praise of world leaders from Europe to the United States and Canada the Rohingya continue to starve. Many are facing death as the country that afflicts them with hunger grows fat off of trade with the EU, China, and the Americas. Women, children, and the elderly are at the greatest risk of dieing as the world looks the other way. And yet despite all this men such as Barack Obama dare to praise Thein Sein and his fellow dictators for their "flickers of progress" in guiding Burma toward democracy. "Progress" in Burma appears however to be far from what we would expect President Obama to align himself with. The progress the government of Myanmar is looking at currently is the ever increasing death tolls in the Arakan state and the Kachin region. This effort to rid the state of given ethnic groups and religions does not reflect democracy, at least in the way the United States practices it, but more directly reflects Mao's cultural revolution. With the confiscation of land to resettle the area with acceptable ethnic groups the Burmese take yet another step toward completion of their genocide. This step forward allows the Arakan authorities the opportunity to build the ranks of Rakhine people and at the same time to decrease what little food the Rohingya had available. But to the silent West this still somehow seems to be another "flicker of progress". 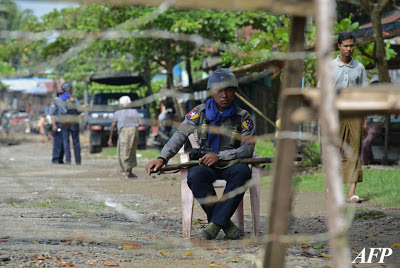 Arakan authorities have also forced Rohingya out of villages that were attacked in the June and October pogroms to further make room for Rakhine settlers. Rohingya who tried to defend or protect their homes and families also now face arrest as their old villages are bulldozed. As of Tuesday, February 5th, eleven Rohingya men have been convicted to ten years for their part in fighting off Rakhine mobs. The homes and villages of these eleven men, from Zeydi Pyin and Hati Para, are now bulldozed. This policy of arresting the male Rohingya once again only points toward the type of progress that Myanmar is looking towards. By arresting the males of the Rohingya community the Arakan authorities leave the Rohingya villages and camps helpless and defenseless. 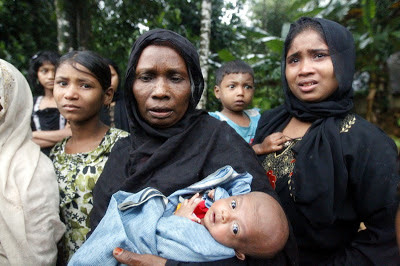 If and when ethnic violence starts again in the Arakan the Rohingya will be at an even greater disadvantage. And with the arrests still taking place they will constantly be reminded of what will happen if they even attempt to defend themselves. Yet despite all of this mounting evidence of a government hellbent on the destruction of a designated ethnic group the world remains silent. When given the opportunity to speak out against the blatant campaign of ethnic cleansing the West has repeatedly shown their incompetence. Western media has gone out of its way to praise Burmese politicians such as Suu Kyi while avoiding the discussion of the Rohingya all together. Their deafening silence on the issue is only further amplified by world leaders who use Burma as a political tool rather than the humanitarian crisis it is. All the while thousands of Rohingya in and around cities like Sittwe are reduced to begging for food just to survive. Relief workers struggle to help those in the most need as Burmese police and politicians fight to find ways to minimalism their efforts. Even with what little aid is flowing through the blockades the Rohingya are still starving to death. And with conditions constantly growing worse, disease and pestilence run rampant. So how much longer are we going to wait before the world begins to act? It should be obvious by now that Myanmar is not even close to showing "flickers of progress". If this situation is not dealt with immediately the Rohingya people of Burma will perish. The outside world must force Myanmar to get serious about their so called "democratic reforms". And most importantly, we must stop the slaughter of the Rohingya and force Burma to allow all humanitarian aid to reach the Rohingya in both camps and villages. Ultimately the world will have to protect the Rohingya and provide food for them. We can not wait till we are looking back at this and telling ourselves "never again" again.